After sharing some photos of Aggie's birthday party this week, I wanted to highlight the star of the show - the DIY pretend play stands. The idea for them is what convinced me this party theme would be perfect for the three year old set. The only problem was just how was I going to get all of this done? 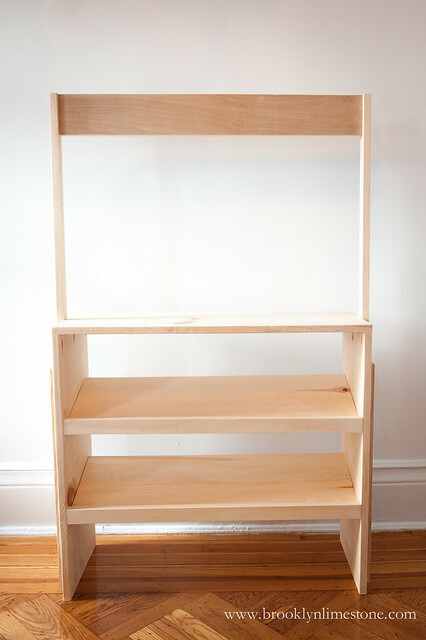 Enter the amazing Jamie of That's My Letter who so kindly offered to help design and build them out of the kindness of her extremely big heart. 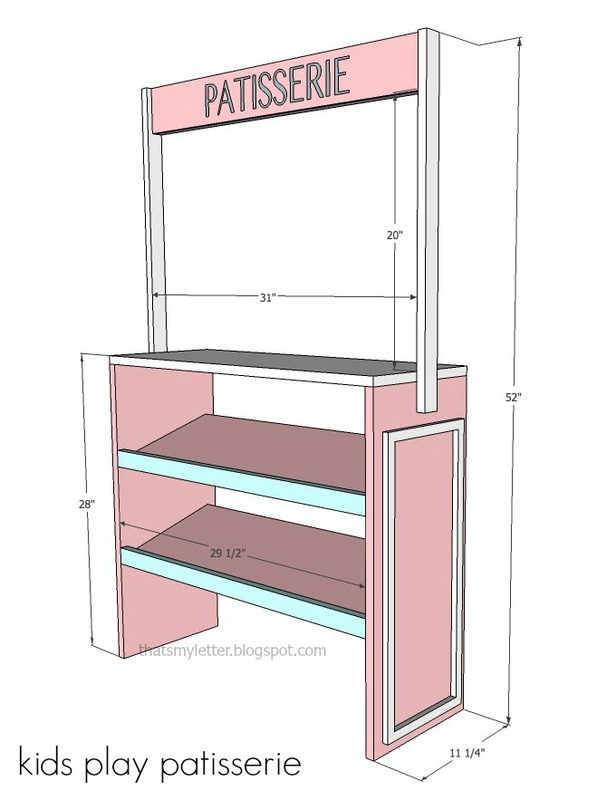 And the love doesn't stop there - she is kind enough to share her hard work with everyone who wants to DIY their own little patisserie (or supermarket, pet store, jewelry store, whatever) by sharing the build plans here. She had no idea just how much I needed the help at that particular time so it was an especially wonderful treat. Needless to say she did a much better job than I could have ever done in a million years. Now on to the details. 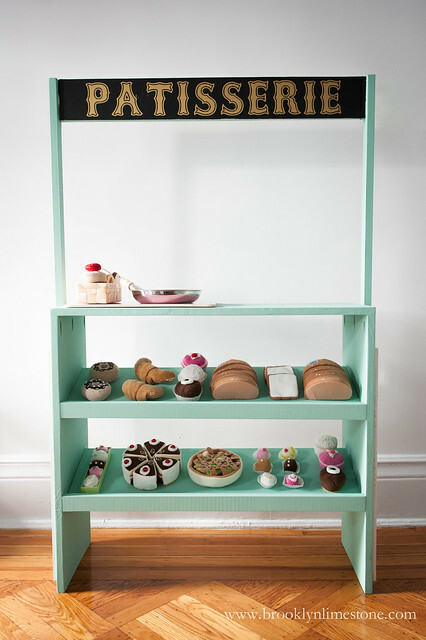 Today's focus is on the Patisserie stand which was the more simple build but ended up being Aggie's favorite. 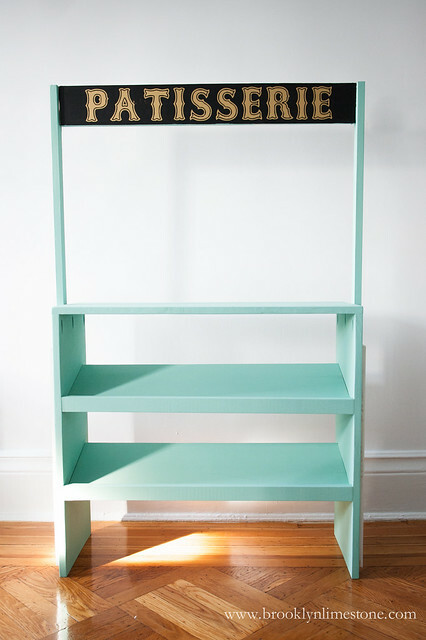 After Jaime had done the hard work of building them perfectly I got to work finding the perfect shade of minty green as an homage to ultimate french patisserie, Laduree. The awning was painted in black and finished with gold letters. Finally the finishing touches of the pretend sweets brought it home. Almost everything was from HABA's Biofino line including the Bread Loaf, Crepe Set, Assorted Cookies, Petit Fours, Sweet Pastries, Sweet Muffins, and Apple Pie. To say this whole thing was a hit would be a big understatement. And even sweeter is ever since the party, Aggie has asked what I'd like from the bakery as she takes a few minutes to make me a little treat everyday. I'm so happy with how it turned out, I hope you'll be inspired to make your own. Stay tuned for more details on how the other two play stands came together later this week. Oh my goodness this is adorable! 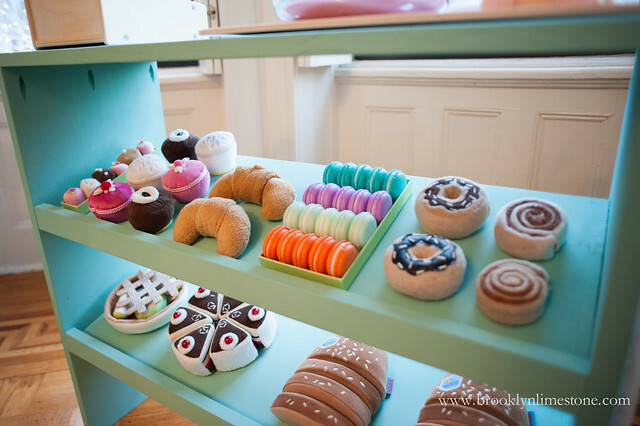 I have to know where the macarons are from, please? Yes, love this!! Where are the macaroons from? Love the set up! Thanks Kayla. I haven't quite decided what we will do with them yet. The menagerie stand will make a good toy storage piece so I will probably move tha to her big girl room. 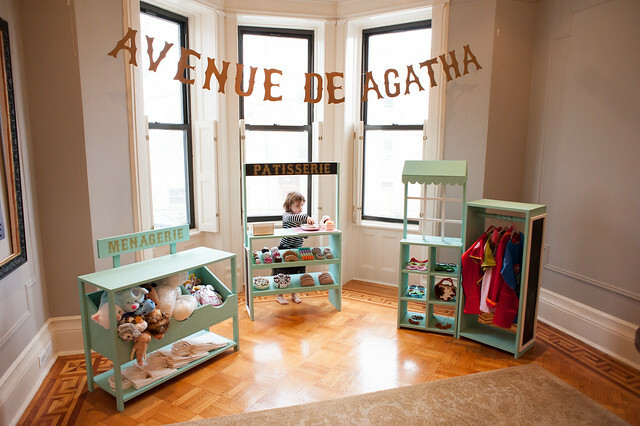 The patisserie and dress up pieces are definitely adorable and I plan on keeping them around for a least a little while as long as she enjoys playing with them. I know when I want to get rid of them, I'll have no shortage of people who would want to take them. Do you remember the name of the perfect shade of minty green? I always struggle with that color, they always seem to be too teal or too mint/lime.